AudioQuest used to be best known for a vast range of high-performance audio cables. It still makes those cables – covering every base from ‘cheap as chips’ to ‘I’ll collect them in my Friday helicopter’ – but has recently diversified its range significantly. First came the Digital Critters (the DragonFly DACs and the JiitterBug, alongside the Beetle that’s still floating around the digital aether), but this was followed by the company’s first headphones, the NightHawk. These, too, were followed by the NightHawk Carbon (a revised version of the original, with the most obvious change being a move from wood-ish ear cups to carbon-ish). As night follows day follows night, the NightOwl Carbon followed in the NightHawk’s clawprints. The next saga in the AudioQuest story moves back to traditional audio, as the Niagra power conditioners roll out. The easy and over-simplistic way of looking at the NightOwl is it is a (mostly) sealed version of the open-backed NightHawk. NightOwl is apt, because the stealthy, silent type that doesn’t leak sound into the environment so you can listen to music to your heart’s content while the rest of the family is watching TV or tuning into kittens on YouTube. NightHawk being open-backed never had that option. As with the first two designs, the NightOwl’s ear cups are made of ‘Liquid Wood’, an eco-friendly sustainable material that combines real tree with reclaimed plant fibre, all of which gets heated, liquefied, and processed so it can be injection moulded into shapes that would be almost impossible to make with traditional woodworking, all the while offering acoustic properties superior to those of conventional synthetic or plastic materials. The original NightHawk’s Liquid Wood ear cups a wood-effect finish that was almost, but not quite, entirely unlike wood, but the process has developed allowing an elegant, none-more-black carbon finish into the mix. Also like its open-backed stable-mate, the NightOwl ear cup housings are shaped like human ears. Perhaps not the biggest surprise around, this makes for a very comfortable fit. There is a lot more to this than meets the eye, however. Literally. 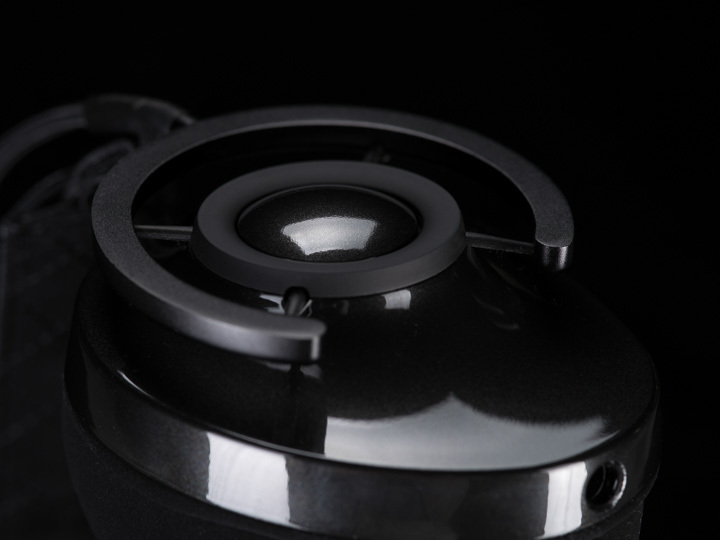 If you took the AudioQuest headphone apart, you’d find the inside of the earcup sporting a series of radial ribs. These are the result of a lot of Finite Element Analysis to find the optimum size, number, and placement of these ribs. No ribs and the earcup sings along with the music. Too many, or the right number in the wrong places, and there’s some odd resonance at the worst possible place. AQ nails this! There are two sets of ear cups – Protein Leather (which is another way of saying ‘not leather’) for the best isolation and Ultra Suede (which is another way of saying ‘not suede’) for longer listening – these are supplied in the textured pleather case. Although there are strong arguments for lambs-leather earcups and fancy leather pouches, I feel sightly less bloodthirsty knowing that only a handful of Pleathers were slaughtered for their plasticky hides. Earcups aside, the headphones are extremely similar in design and execution. The minimal, but effective, single bar headphone (wrapped in the same kind of black braided sleeve found on many AudioQuest cables... nice touch!) with a stretchy pleather headband makes the headphone light and comfortable on the head, and these attach to the ear-cups through a variation on a theme of a microphone shock-mount. This is great for placement on the head, but paradoxically, there is some transmitted ‘clanking’ if you touch the headband. Both the supplied cables (minijacks to the headphones, 3.5mm TRS stereo jack with a 1/4” jack adaptor supplied) and the inside of the earpads are clearly marked for left and right channels. The Y-shaped cable has a simple in-line phone/DAP controller at the point of contact, and is solid enough to be no-tangle. The connector at the source end is gently curved, too, making it equally suitable for devices that prefer straight or 90° insertion.